Every time I’m facing the Deliver Remainder screen, I always ask myself what I should indicate in the quantity field and which button should I press. It’s not difficult to get it, but I know I will forget again next time and i twill probably make this clear for some of you as well so here I am writting. What is the Deliver Remainder form purpose ? It applies on purchase and sales order lines, and here I will focus on purchase order examples. When you have ordered a certain quantity for a line, and you know for sure you won’t be deliver for all the quantity ordered, you can do two different actions if you want to close the line, meaning have it fully delivered and not waiting for a delivery that will never come. When running the product receipt, you can tick the Close line checkbox. Then if you’re receiving x % of the quantity ordered and you know you won’t receive what’s left you can process this. Take care of the underdelivery setup because you will need to have this setup at least to 1 – x if you want to close your transaction in that way. If you don’t know for sure when running the product receipt that you won’t receive anything else, you may not you the Close checkbox. But after waiting few days/weeks, you want to close the line anyway because you’re sure at that time that nothing will be received for that line. Then, you can use the Deliver Remainder functionality to close the line. Here is our simple example, and then I’ve declined all possibilities. So I’m ordering for a quantity of 10 in ITEM-YR12. Then I’m proceeding to a partial product receipt of 2. What I can see in the transaction is that 8 are still ordered and the line is still Open. If I want to close the line after doing the receipt, I will use the Deliver remainder option available under Update line. Here, I’m facing the form, with two Deliver Remainder field (Purchase Quantity) and 3 buttons : OK, Cancel Quantity and Cancel. Cancel is cancelling what you are trying to do right now. It’s a basic cancel button and you go back to the previous screen without any change. Whatever you indicate in the Deliver remainder fields, it will always behave the same way : it will close the line. In more details, the 8 of my item ordered will be deleted, meaning the line will update to received. Here we have different cases : first if you’re updating the Purchase Quantity field to something, the Inventory Quantity will update automatically accordingly. If I’m reducing the 8 to 3, and press OK, the system will wait for 3 items to be received (so the Ordered quantity has been reduced to 3). If I’m reducting to 0, and press OK, the behaviour is the same than Cancel quantity button. If I’m updating the Inventory quantity to 4, the Purchase quantity remains at 8. By looking at the transactions, the Ordered quantity has been reduced to 4. When running the product receipt, the default quantity to be received is displaying 8. If I’m pressing OK on the Product Receipt form with 8, it will validate anyway only 4. This will work only if the Underdelivery is setup to 50 (for my case). To conclude I can understand MSDyn365FO behave properly but I can’t see any business meaning for using only the Inventory quantity instead of Purchase quantity. If there is any, please share it in comments. It’s more relevant to distinguish the Purchase and Inventory quantity if it applies to item purchase and stored in different units. So here is one item purchase in EA and stocked in Bag (with a factor of 1 bag = 10 EA). Then going to Deliver remainder, you notice the difference quite obvisouly. The behaviour doesn’t change according to the previous tests. 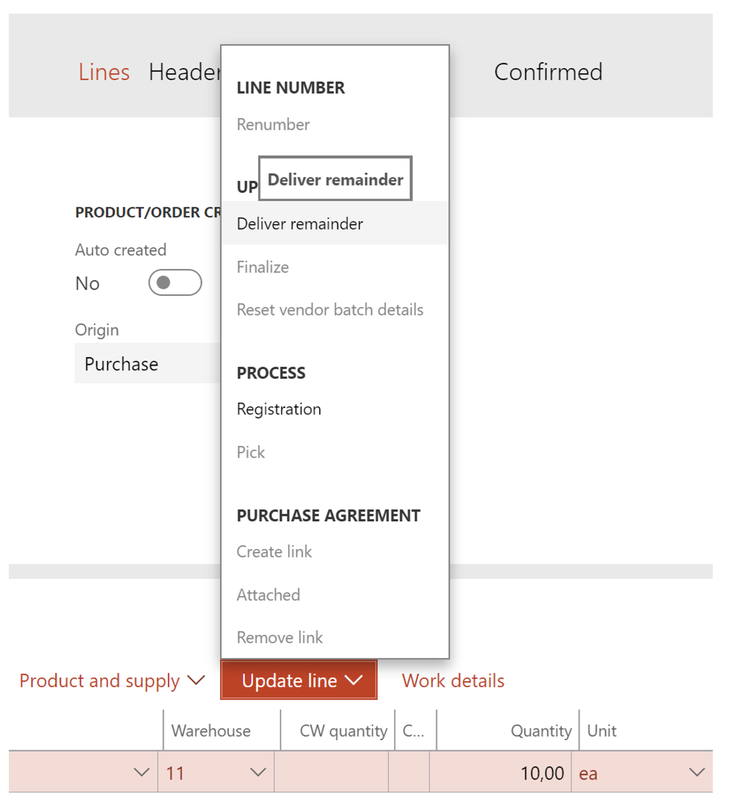 L’article All about the Deliver Remainder functionality in order lines est apparu en premier sur D365Tour.